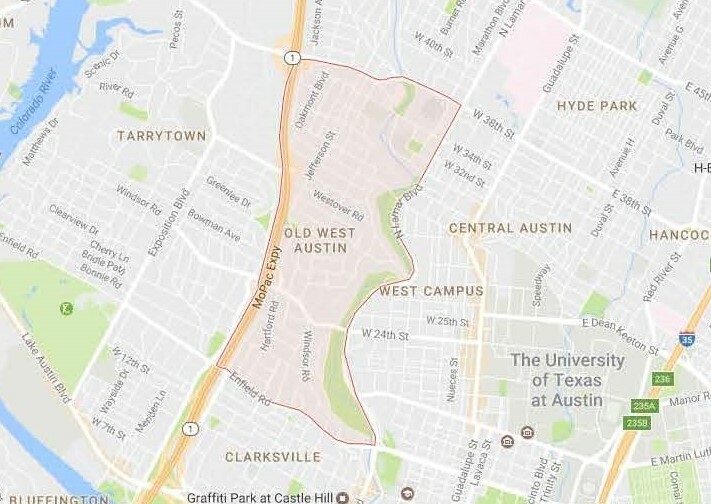 The Old West Austin/Brykerwoods neighborhood is rich in history dating back to the mid-1800’s, not long after the city of Austin was founded. Also referred to as Brykerwoods and associated with Pemberton Heights and Old Enfield, this area is bounded north to south by West 38th Street and Enfield Rd and West to East to Mopac Expressway and Lamar Blvd. This charming, upscale neighborhood just west of downtown and north of Lady Bird Lake boasts historic homes, restaurants and shopping, easy access to both the entertainment district and hike and bike trails, green spaces, and natural beauty. Beyond the obvious, there are some convenient “extras” Old West Austin offers it’s residents. Seton Medical Center, Austin Public Library, and a full service .U.S. post office serve the community. Fun tidbit of trivia: Hill-Bert’s Burgers was the first “burger delivery” in Austin founded in 1973 by a UT student… and today, Hill-Berts still delivers burgers to neighborhood doorsteps. Named one of the top great neighborhoods in America by the American Planning Association, Old West Austin is one of Austin’s highest sought neighborhoods for families, young couples, and singles alike. It’s unique history and livability has earned it a strong neighborhood association and various organizations are dedicated to preserving the historic homes and character of the area. Pease Park is a contributing element to the Old West Austin Historical District. The classic WPS-style stone picnic tables throughout, the majestic stone walls along The Shoal Creek Trail, and it’s dedication to rehabilitation and beautification has, deservedly so, been recognized by the Texas Recreation and Park Society as a “Lonestar Legacy Park” for it’s cultural significance. The home of popular community events such as “Movies In The Park” and “Eeyores Birthday Party,” Pease Park manages to provide a sacred space where past meets present. Almost 100 years ago, The Tudor Cottage (now serving as restrooms) was one of the earliest buildings in Austin construted as a park facility. And prior to that… waaaaay prior…11,000 years ago, Native Americans escaped the frigid Northern winters by settling around Shoal Creek’s luxurious green landscapes. Offering miles of trails, playscapes and splashpads, basketball & volleyball courts, and the noble elegance of the greenbelt, Pease Park is a worthwhile and valuable destitation of the ages – for all ages.